Airnesco: World Leader In Small & Large Calibre Gun & Barrel Cleaning Equipment. 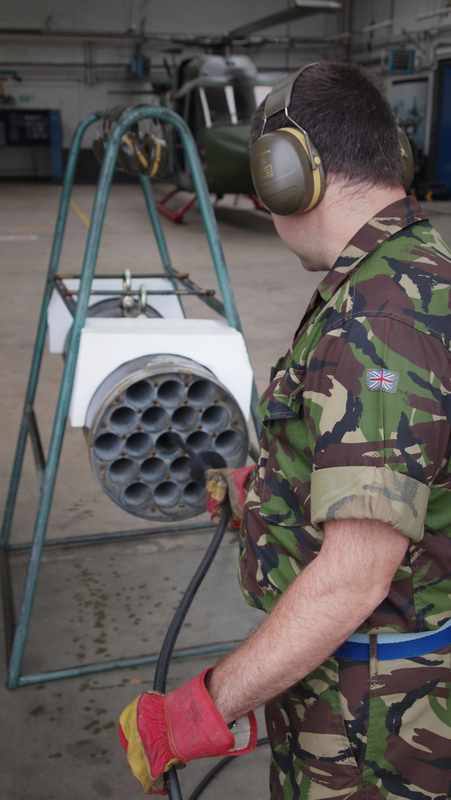 Calling upon our extensive knowledge and experience within the industrial industry, we developed a range of weapon care solutions for the Defence & Aerospace industry. Pneumatically powered, the Barrel Cleaning System suits both smooth and rifled barrels, mortars and launchers, with a calibre of 20mm upwards. The system is compact, easy to stow and virtually maintenance free. 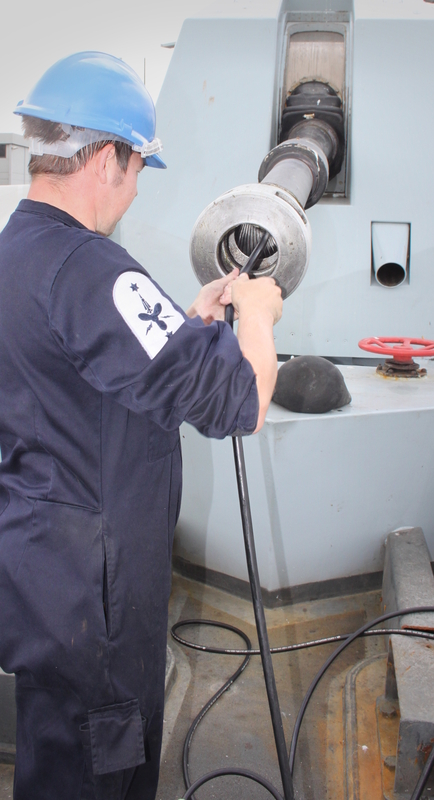 The BCS comprises of range of brushes and all necessary attachments to carry out weapon care duties across a wide range of weapon platforms, the equipment is stowed in a single hard case or soft bag depending upon the applications requirements. Its fast and effective one-man operation enables the operator to clean a large calibre weapon system in less than five minutes. During the late 1990’s the system entered a trial and evaluation period with the UK MoD. By 2000 the Airnesco BCS was accepted into service with both the Royal Navy and British Army; our system has since been in service all over the globe on both exercise and during live operations. Further to its continued service within the United Kingdom’s Armed Forces the BCS is also employed by several Armed Forces throughout the world, the number of which is growing every year. Airnesco’s Defence Business model has been founded on the use of Military Knowledge, Industrial Experience and Global Partnerships. These three elements have enabled Airnesco to present a simple and highly effective piece of equipment to operators on the modern battle field. The BCS has proved its worth time and time again, supporting Gunners, Mortar Teams and Armoured Fighting Vehicle Crews, wherever they are deployed, whatever they may encounter. An introduction to the system, demonstrating the method of operation and the equipment included within a typical BCS kit. 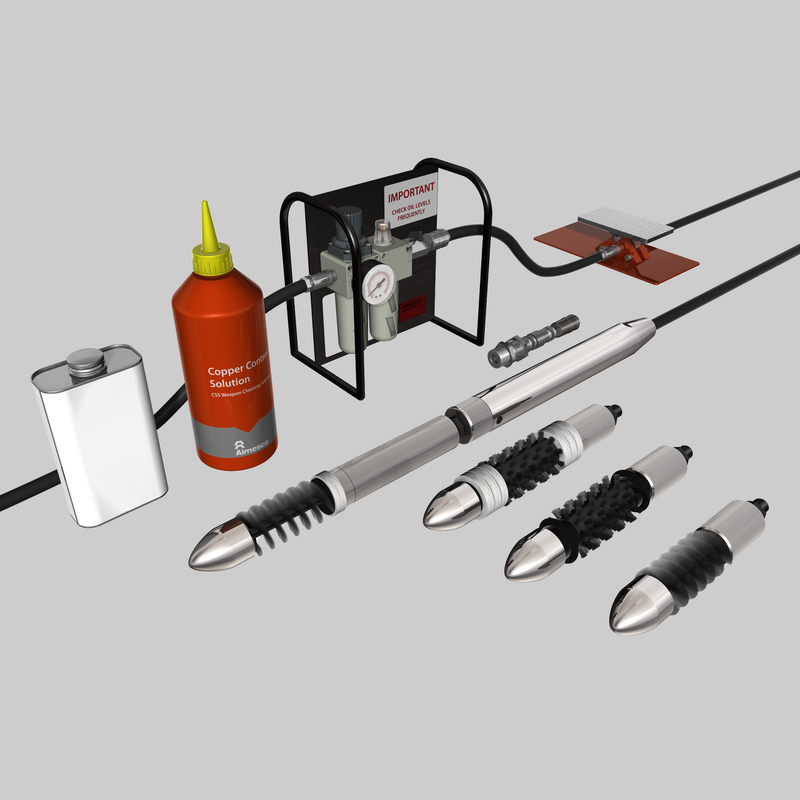 A typical kit would include a range of four brush types which cover all the requirements of barrel care for the modern weapon platform, we can also supply the kit as a ‘tailored’ solution to suit your specific requirements. The system is controlled by one operator and can be rapidly assembled and dismantled, using quick release couplings throughout. The brush is secured to the Ferret and controlled by a foot valve; air is delivered through the foot valve via a filter lubrication unit. The ferret is then placed into the barrel, breech or muzzle end. it travels along the barrel and on reaching the other end the brush travel is reversed and it will automatically return down the barrel towards the operator. The average cycle time is one minute for a double pass. The above video is also an excellent example of the evolution of our equipment, showing our early type brushes and aluminium cases through to the current range of brushes and soft case storage solutions. Our kits are now supplied with the ever popular DEFStan Peli case as standard; the soft storage option shown here is often selected for applications where storage space is at premium. As time passes materials and manufacturing technology improves, then so does our production methods; while our system has proven to be reliable throughout many years of service, we endeavour to improve our range of products with these advances in technology. This system is suitable for weapon platforms with a calibre between 20mm and 40mm. The small gauge BCS is very compact and can be operated without a foot valve to further reduce the kits storage volume. The system is stowed in a hard plastic type case as standard but can be supplied with a soft carry bag as an alternative. As with all our kits, a range of brushes are available and the system can be tailored to suit the applications requirements. This system is available for weapon platforms with a calibre between 57mm to 203mm (larger sizes are available). 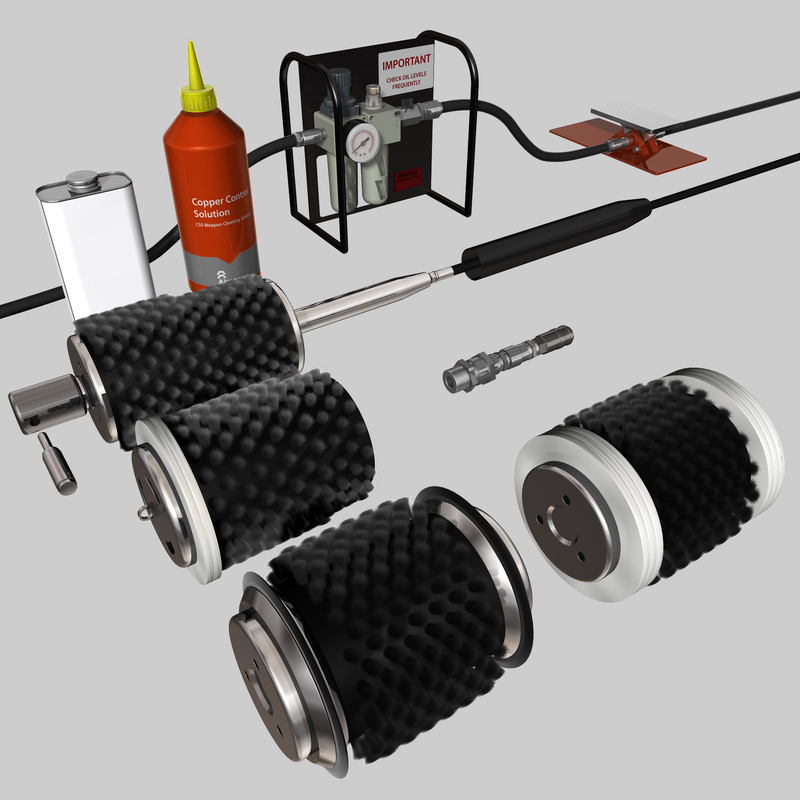 The kit comprises of a free standing filter lubricator unit and is controlled through a foot valve. Again, this system is supplied with a hard plastic type case as standard but can also be stowed in a soft carry type bag. A wide range of brushes are available and the system can be tailored to suit the applications requirements. "The equipment itself was considered to be an unqualified success as it not only cleaned the bore effectively but also achieved this with less effort than the normal method. In addition, many man-hours were saved during an intensive period of firing. It is recommended this equipment be supplied to all 4.5 Mk 8 fitted ships as soon as possible and it is requested that the ship be allowed to keep the current equipment until the production model becomes available. Your assistance in providing the Ferret at such short notice and your obvious enthusiasm for the equipment is greatly appreciated." "This is to thank your company for the assistance given during our investigations to source a pneumatic cleaning system for our 155mm and 105mm artillery equipment barrels. During demonstrations users have been impressed by the efficiency of the system and the time saved on completing what is currently a manpower intensive task." "During the complete trial period your equipment performed very well. The equipment has been used when we maintained the gun. It created a great interest and the user asked for your address to be able to contact you. As we were operating in the terrain all the time, we had to use compressed air from the towing vehicle and that performed very well." "It saves so much time, nobody liked doing the job before, now we just connect the airline from a truck and it's all over in minutes."